Children losing their primary (“baby”) teeth is both natural and necessary. So, is it really that much of a concern if they lose one early? The answer is yes — premature primary tooth loss could have long-term consequences for the permanent teeth as they develop within the jaw before eruption. Primary teeth play a crucial role in this development: as the permanent teeth form and grow the primary teeth serve as placeholders until they’re ready to erupt. A natural process then takes place in which the primary tooth’s roots dissolve (resorb) to allow them to fall out. Once they’re out of the way, the permanent teeth can then erupt. If, however, they’re lost before the permanent teeth are ready, it leaves a space in the child’s bite. The dynamic mechanism between teeth and the periodontal ligament causes adjacent teeth to move or “drift” into the space. This can crowd out the permanent tooth intended for the space, causing it to come in improperly forming a malocclusion (bad bite), or it may become impacted and remain partially or fully below the surface of the gums. This poor dental development could lead to extensive orthodontic treatment later in life, which is why we seek to preserve even decayed primary teeth for their entire natural lifespan. If the tooth is lost, however, we need to take action to preserve the space for the permanent tooth and avoid costly treatment later. 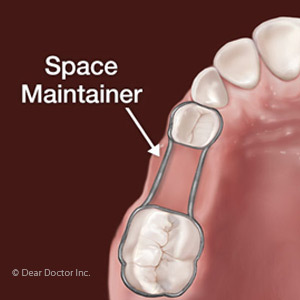 This usually calls for a “space maintenance” appliance — a type of orthodontic “retainer” — worn by the child to prevent other teeth from drifting into the space. Designed by your orthodontist, the appliance can also perform a cosmetic and social function by causing the space to appear unnoticeable. Maintaining that space requires monitoring — especially by an orthodontist — and continued dental hygiene and care both at home and at the dentist’s office. The extra care preserving the space caused by premature tooth loss will help to ensure your child’s dental structure develops properly and their future smile will be an attractive one.